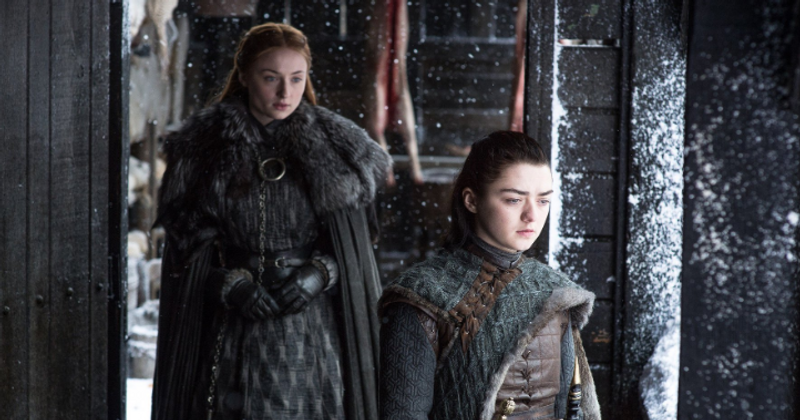 Some fans have recently pointed out a detail that predicts the possible death of Arya and Sansa Stark. 'Game Of Thrones' fans are desperate to know how the series is going to end and the release date of the final season is getting closer day by day. The cast is keeping all the details of the series a secret and the fans are trying to decipher the details of what can be expected to happen in the upcoming season. Amongst all the possible fan theories, some fans have recently pointed out a detail that predicts the possible death of Arya and Sansa Stark. The fans of the characters are going to be heartbroken but this theory might just be true. According to Cosmopolitan, some fans have noticed the statues of the characters from the latest trailer of the upcoming season that was very recently released. The statue of Sansa Stark in Winterfell might just be a sign of her death. If you notice the statues of Robb, Catelyn, and Ned Stark are made after what they looked like in the age when they died. Now Sansa's statue that was shown in the trailer is from how she looks at present, which is at the start of season 8. Not only this but Arya Stark's statue also appears to be the same age as she is shown in season 8. This could mean that both the sister are going to lose their lives after escaping death so many times, especially Arya, who has been through a lot. Another thing that is shocking that even Jon Snows statue is shown but he looks much older than how he is shown in the season. That means maybe Jon snow might survive and lose out on all his other family members. The character as compared to the first season has changed quite a lot. Not just age but also their personality wise. The upcoming season would show how powerful the Starks have become after going through a lot of problems which followed after the brutal death of their father. It's hard to exactly tell who will be alive and who is going to die. The series is releasing on 14th April, till then we can just keep guessing.